After a good deal of use, we've come to a mixed opinion of the Sony a7. As much as we like the idea of a small mirrorless camera with a full frame sensor, we ran into more issues than we think are reasonable for the camera's price. Many of the default controls behave oddly, adjusting settings we wouldn't expect, and there are a few image quality issues we find disappointing on an advanced full-frame camera. Thankfully the Sony a7 can be customized to suit most of our needs, making for a better experience. There's no question that creating a mirrorless full-frame interchangeable lens camera finally allows a body that's as slim as a forty-year-old camera like the Olympus OM-1, which was a breakthrough in its day, much like the Sony a7 is today. The Sony a7's hard edges and semi-gloss paint are oddly off-putting at first, but they grow on you. The angled EVF hump is indeed an attempt to recall a bygone era, just as Olympus did with the OM-D E-M5. At first it looks a little artificial and slightly odd, thanks primarily to the camera's thinner profile and short flange-back distance, which limits how far forward the front of the 'pentaprism housing' can protrude. But it wasn't long before we got over any thought about it and focused on the camera's working surfaces and the images it made. As for the grip, we would have almost have preferred no grip at all, as this one doesn't fill the hand enough to offer a sure hold. We like most of the controls, including the rear control dial; however, the front dial is easy to forget, and hard to actuate when you remember, and the EV compensation dial turns accidentally in a bag, and even when just hand-holding the camera; we have to check it every time we remove it from the bag. It seems like it should be stiff enough, but perhaps too much of it is exposed to the right side to prevent accidental activation. 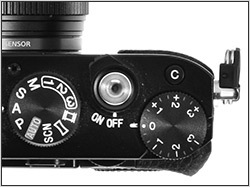 Like the NEX-7, the a7 can use an electronic first curtain shutter. This significantly reduces operational noise by eliminating the need for the shutter to first close, then open to start each exposure. Instead, the exposure starts with the physical shutter already open for live view, gating electronically down the sensor to start the exposure. 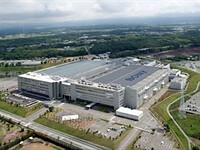 The physical second curtain shuts to end the exposure, resulting in only a single curtain sound in this mode. Nevertheless, the Sony a7's shutter is loud, whether in electronic shutter mode or not. It's a little quieter than the a7R, perhaps because of the composite front plate, but both are louder, and make noise longer, than most competing cameras, regardless of shutter speed. Focus is quiet, however; and the only other effect the a7 has on the photographer's environment is via the very intense amber AF-assist beam, which is quite bright from the subject's perspective, and sometimes it overwhelms the scene, reducing the chance of successful autofocus. Turning it off usually resulted in faster autofocus acquisition. While shooting portraits with the Sony a7 and a set of studio lights, we found the camera performed very well, focusing quickly under the modeling lights and delivering excellent image quality. However, when shooting in Manual exposure mode with strobes, especially indoors, you're presented with a dark viewfinder and LCD; even with your modeling lights turned way up. This is because, by default, the Sony a7 previews the expected exposure given the ambient light levels; in our case that delivered a black image to the display because we set the exposure for the strobes. Changing the Live View Display menu item to 'Setting Effect OFF' allowed the live view image to gain up, making image framing possible despite the manual exposure settings. SLR users will be unfamiliar with this aspect of mirrorless cameras because they're used to shooting with an optical viewfinder. 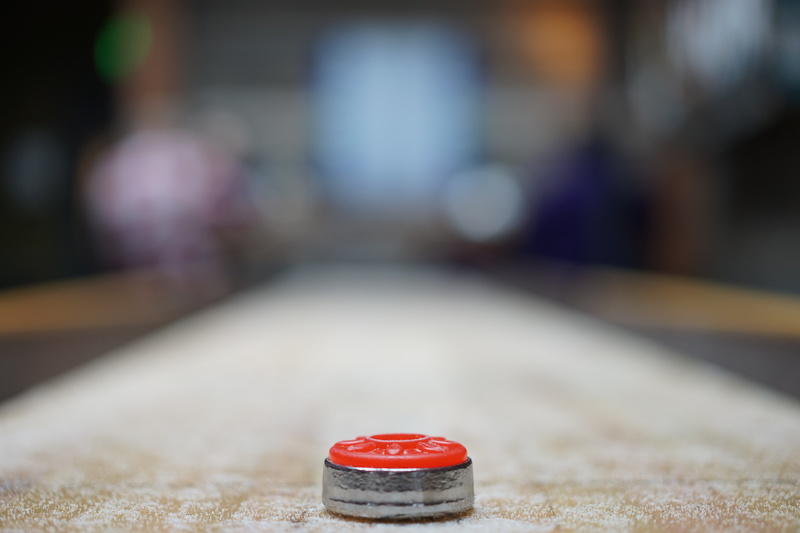 To us, handling is a combination of feel, accessibility, and responsiveness. Most of the controls on the a7 are accessible, and feel good: buttons press cleanly, dials turn crisply, and most of them are about where we'd expect. In the responsiveness department, the only noticeable lag is when powering on the camera, which can take between one and three seconds, and switching automatically from the rear LCD to the EVF. This takes about a second, which isn't really fast enough. It's enough time to miss a shot; over time, you learn to plan for it and move more quickly to the EVF if that's what you think you'll need. 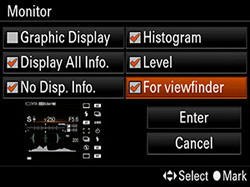 The menus let you select which view modes are available, and you can engage different options for the electronic viewfinder and rear screen. For its part, the EVF is a means to an end - much as we prefer an optical viewfinder, knowing that the a7 is going to capture an impressive image in a smaller package than the average full frame digital SLR makes the EVF worth tolerating. We struggle with its dimness in bright light, but appreciate the large magnification and reasonably good color. Its benefits are significant too, though, allowing the same on-screen controls as are available on the LCD, and even letting you customize which items appear on one and not the other. One issue that came up is that the eye sensor that automatically switches between the LCD and EVF is too sensitive. For example, if you're doing waist-level shooting with the LCD tilted up, the a7 will switch over to the EVF, even though your body is still 6 inches away. At first, it looks like Sony has simply taken the RX1 body (right) and added an extra dial - leaving an odd combination of twin control dials and an exposure compensation dial. In use, it turns out there's a shooting situation in which it suddenly makes sense. The obvious question is whether the a7 has ended up with more dials than it strictly needs - it's certainly easy to draw the conclusion that Sony has looked at its RX1 design and added a dial, but not thought-through whether it then renders any existing controls redundant. In the case of the four-way controller dial, which Sony calls the 'control wheel,' it introduces a problem: by default the wheel, when spun, adjusts ISO. That's not bad by itself - indeed, it can be convenient - the problem is the dial turns too easily by accident. Several of our gallery shots were captured at ISO 50, which was quite a surprise, as we would generally have it set to either Auto or some other specific setting; 50 was never chosen. It wasn't until we had more time with the camera that we discovered the control wheel was changing ISO without our knowledge, so ever since we have disabled the control wheel altogether, as we didn't want to be unconsciously adjusting anything with a live dial; it turns way too easily. In use, the two main control dials don't ever end up in conflict with the exposure comp dial - because as soon as you use the exposure comp dial it overrides any adjustment you've made with the other dials. And there's one situation in which having two control dials and a dedicated exposure compensation dial is useful - offering an effective 'Shutter and Aperture Priority' mode. 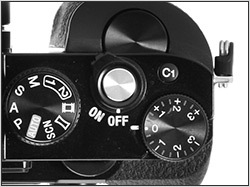 The cameras continue to offer Auto ISO in Manual exposure mode, with one dial controlling shutter speed and the other setting aperture. At this point, the ability to change intended image brightness using the exposure comp dial becomes really useful. Though it has what is technically an E-mount, thankfully the a7 has a modified version of the Alpha menu, rather than the confounding menu from the NEX cameras. You can either move through each individual page with the left and right arrows, or use the up arrow to jump to the tab of grouped pages that you want - making it much easier to get to the setting you want to change. What's not easy, though, is getting to the tabs if you're on a lower menu item. Unlike most other systems, there is no control to simply switch back to the tab without scrolling up through the entire list. 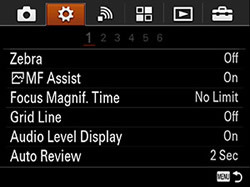 Sony abandoned the NEX menu system for the a7 series, but added a row of menu tabs across the top. Alternately, you can just scroll through the entire selection of 24 screens by staying on the lower deck, which is the way Sony's other Alpha cameras work. Many of the default settings on the camera were not to our liking, but a little adjustment of settings makes the a7 much more enjoyable to use. 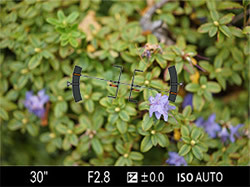 For instance, the simple act of picking an autofocus point is a multi-button chore until you learn the workaround. By default, you have to press the Function button, and then navigate to the Focus Area menu item. Press the OK button, then, with Flexible Spot highlighted, press the OK button again. Finally you can use the arrow keys to move the AF point around the screen. (Turning the rear control wheel selects from among three sizes for the AF point, another nice feature.) Depending on whether you already had Flexible Spot selected and enabled, that's between three and six steps just to move the AF point. After sitting down to solve the problem, we discovered you can set the Custom 1 button to 'Focus Settings' (not 'Focus Area' as intuition might suggest), which gives you one-button access to the AF point. This brings it into line with most of its rivals, where the number of button presses required is usually one or zero. One more thought about menus. As we often review cameras in teams, it's not uncommon to find a camera's settings have changed when you get it back from testing or use by another. 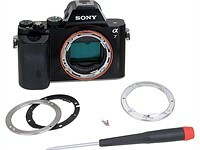 The Sony a7's menu and navigation is confounding enough it was often easier to leave the settings alone and get the shot, rather than take the time to dig in and make the needed change. The Sony a7 has an easy-to-read level system that displays both roll and pitch. For our money, the most valuable feature spreading across more cameras is the levels display. Showing both roll and pitch, the levels on the Sony a7 are always on when we're using the camera. Particularly when employing the tilting LCD, we like the quick verification that we're holding the camera level with the rest of the world: it means fewer shots rejected for a crooked horizon. 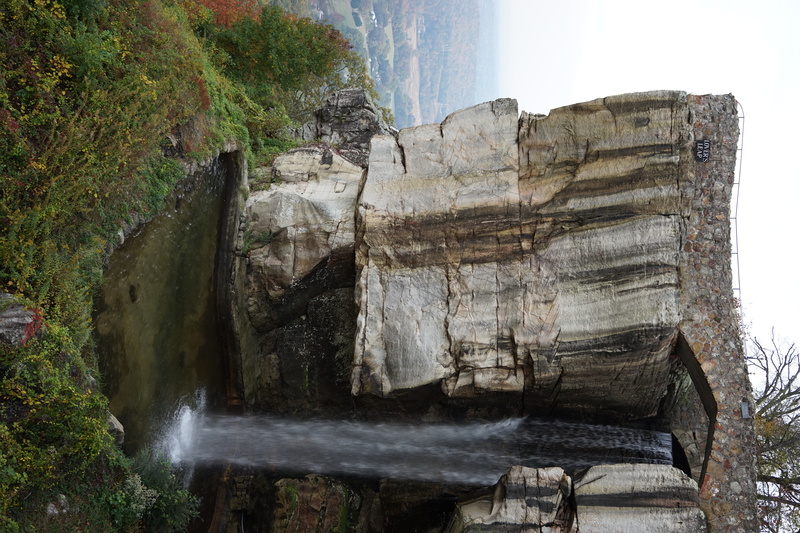 In our early shooting with the a7 and all three lenses in Tennessee, we had more out-of-focus shots when shooting with the 28-70mm OSS lens, a fact we mentioned in the preview. When we got back to Seattle with a full set of shipping-quality cameras and lenses, however, we weren't able to reproduce the trouble with focus, which eliminated one concern. 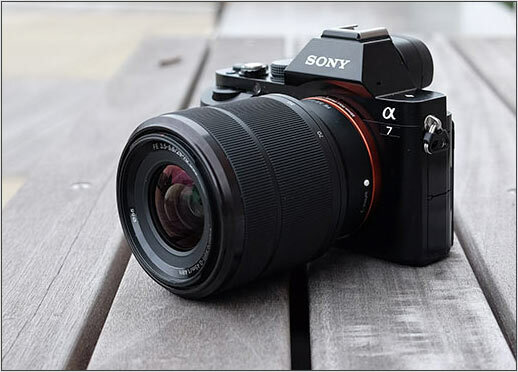 Still, because the of the difference in resolution, Sony's overaggressive anti-noise strategies affect the perceived sharpness of the a7's images when compared to the a7R. What should be soft bokeh is too often re-rendered as something that looks more like paintbrush strokes than a simple out-of-focus area. 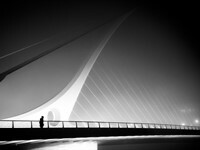 See our Image Quality pages for more on this subject, one that affects our opinion of the a7 in no small way. One of the more insidious issues we encountered with the a7 was its overwhelming love for a single shutter speed - 1/60 sec - when using Auto ISO. While you'll see this most often indoors and in low light, it also happened in daylight conditions. 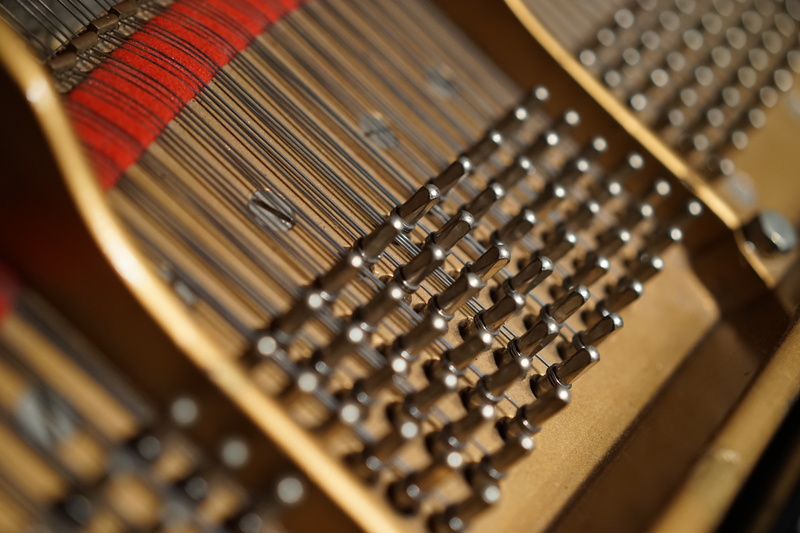 If you're taking still lifes, this isn't an issue, as most of us can carefully handhold a camera at 1/60 second. 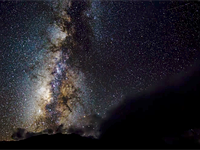 However, if anything in the scene is moving even a little bit, the photo will likely be blurry. You can see that the vast majority of the photos taken with the a7 had a shutter speed of 1/60 sec. The root of this issue is the camera's Auto ISO feature. The a7 doesn't let you set a minimum shutter speed, but its 'floor' is 1/60 sec. 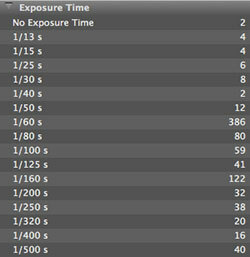 When light levels are low enough that 1/60 sec won't cut it, the camera will boost the ISO by a stop or so, but leaves the shutter speed where it was. Eventually, the Auto ISO will reach its limit (which is 6400 by default, and can go up to 25,600), at which point the shutter speed will drop below 1/50 sec. What was interesting was that while the a7 did not observe the traditional 1/focal range guide for selecting shutter speeds with FE lenses, it did with A-mount lenses attached with the LA-E3 adapter. We were unable to experiment with the FE-mount 70-200mm F4 lens, as it's not yet available. Once we discovered the a7's nearly constant use of the 1/60 sec shutter speed in low light, we resorted to shooting either in shutter priority mode or using Program Shift, strictly to avoid the shutter speed falling that low. The three FE lenses we had to shoot with were the Carl Zeiss 35mm F2.8, the Carl Zeiss 55mm F1.8 and the 28-70mm F3.5-5.6 OSS lens (a Zeiss 24-70mm F4 lens is planned, but we've not seen one yet). All three are well built, but only the 35mm keeps the a7 small; the other two are quite a bit longer, particularly with their lens hoods mounted. The 35mm's lens hood is tiny by comparison. There's some wobble as it focuses, but it's quick, and focus is usually pretty accurate. Oddly, there's more wobble with this lens on the a7 than on the a7R. ISO 250, F1.8, 1/100, 55mm F1.8 lens. The 55mm F1.8 is quite sharp and also enjoyable to use. It also has a very thin depth of field wide open, and produces nice background blur. One of our favorite aspects of the Sony a7 is its built-in Wi-Fi feature, which works better than others we've tried recently. It's not super fast, but it's fast enough we haven't stopped using it. In situations where we'd normally make do with our smartphones to capture a quick shot, the a7 has allowed us to create better shots, ones we'd be more proud to share, as well as more likely to keep. 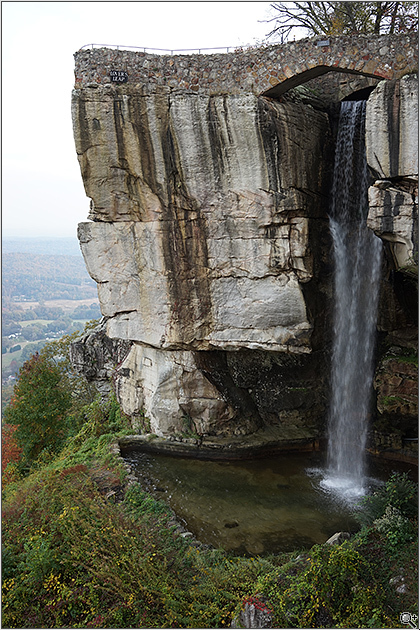 The 1.7MP file size that's transferred from the camera to the phone offers plenty of resolution for posting to Facebook and Instagram, and my friends got to enjoy images I captured on a real camera, rather than my smartphone. Transferring photos is as easy as calling them up in Playback mode, pressing the function button, selecting the "This Image" button, and touching an NFC-capable smartphone to the right side of the a7. In a matter of seconds, the image is on your smartphone and ready to share. ISO 100, F4, 1/160, 35mm F2.8 lens. As we said, we're ambivalent about the Sony a7. There are a lot more interface difficulties than we'd like, and its image quality isn't quite as good as we expected, thanks primarily to overaggressive noise suppression. We'll get into that in the image quality pages and conclusion. However, it's tough not to admire the Sony a7's small package, and its ability to work with all kinds of full-frame lenses, even if it's a bit more difficult than we'd like (See Barney Britton's write-up on that unique aspect of the Sony a7). 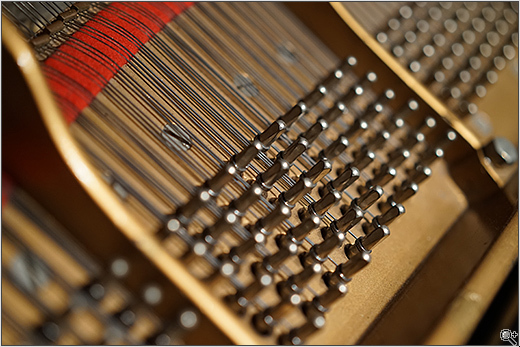 ISO 1250, F2.2, 1/100, 55mm F1.8 lens. One of us would choose the Sony a7 as a good low-price full-frame camera, even given its limited selection of native lenses. Shooting raw seems to mitigate most of the problems with the JPEG files, including the noise suppression, but we think it's fair to warn those who would shoot in JPEG that the quality is noticeably reduced. 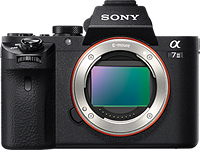 But we didn't find enough advantage to the a7's phase-detect autofocus to choose it over the a7R, whose higher resolution and very accurate contrast-detect autofocus make its images more satisfying.